The best weddings are the ones that truly reflect the personality of the bride and groom. One of the best ways to personalize your wedding is to make your own unique DIY wedding favors. Although you might not think that you and your fiancé have time to take on yet another project during the wedding planning process, these DIY wedding favors will come together in no time and may save you some money. Additionally, these projects are fun to do and relaxing. After you have had yet another stressful conversation with your caterer (or your future mother-in-law), you might just enjoy sitting on the couch and making these DIY wedding favors for your friends and loved ones. Instead of giving your guests a trinket, consider giving them a snack instead. Many treats are easy to make and when put in pretty packaging, they can be quite festive. 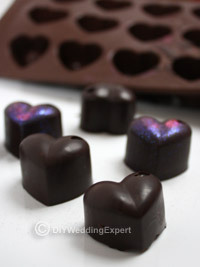 You might like to create your own unique DIY wedding favor chocolates, check out my step-by-step project on how to create your special wedding chocolates. My friends’ wedding was in Ohio, the Buckeye state. In order to give the wedding a little local color and flavor, her and her fiancé made a few batches of delicious peanut butter Buckeye candies. 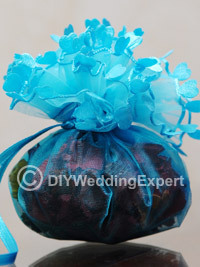 Once the chocolate was set, they wrapped three candies in cellophane and tied the package with a blue ribbon. If your region is known for a special treat, consider making a batch and giving a small amount to each guest. You could give each guest a little envelope containing flower seeds and growing instructions. 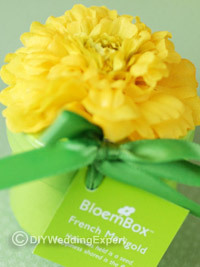 Here you can see a beautiful marigold box containing flower seeds, these garden favors are available in lots of different colors and designs. So you can choose the ones that fit with your wedding color theme. You can also make your own seed DIY wedding favors. You could choose your favorite seeds and decorate each envelope with a stamp or sticker. If you have the time, you could make a custom stamp with your name and your fiancé’s name and your wedding date. 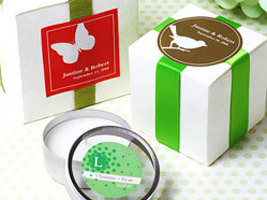 You could also outsource a bit of the DIY process by ordering a custom stamp online. There are also plenty of websites where you can create your own personalized labels that are fairly affordable that will give your diy wedding favors a very professional look and finish. If your guests plant your flower seeds, they will think of you and your wedding day each time they see their beautiful flowers. If you and your spouse-to-be are big coffee aficionados, give your guests a special coffee mug. You can buy plain white coffee mugs at many dollar stores. You can then draw on them using special markers that will leave permanent designs even when the mug is washed. These are available at nearly any craft store. If you are planning a wedding with a vintage theme you might think about using cups and saucers collected from junk stores or thrift shops to create you own vintage style DIY wedding favors. 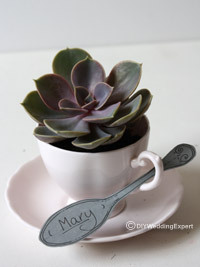 You can fill them will edible candies or cute little plants like these ones from my vintage wedding favors tutorial. These are just a couple of the many DIY wedding favor projects that you can make. No matter which DIY wedding favors you choose, your guests will certainly remember how unique your special day was.